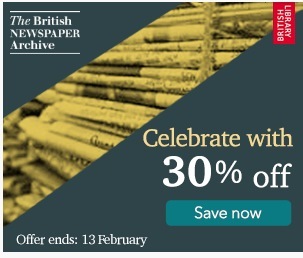 As you must surely have heard by now (see my blogpost, if you haven't), the online British Newspaper Archive has recently sailed past the 30-million-pages milestone. To celebrate, there's a very welcome 30% off any subscription package to the database, which holds 167 historical Irish titles in addition to its huge holding of English, Welsh and Scottish publications. A subscription provides unlimited access to the entire online library. The offer will end at 11:59pm GMT on Wednesday 13 February. To take advantage of the discount, click/tap the image; the promotion code will have been applied when you reach the Subscribe page. Please note that after the initial subscription period, your subscription will be automatically renewed at the regular price unless you un-tick the 'auto-renew my subscription box' in the My Account section of the site. Terms & Conditions apply.